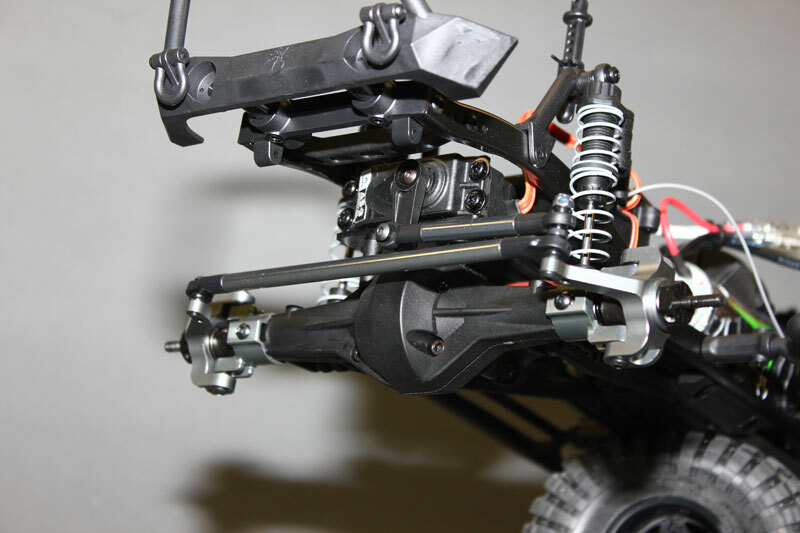 The Axial SCX10 platform comes with a variety of bodies to fit the tastes of trail truck adventurers. 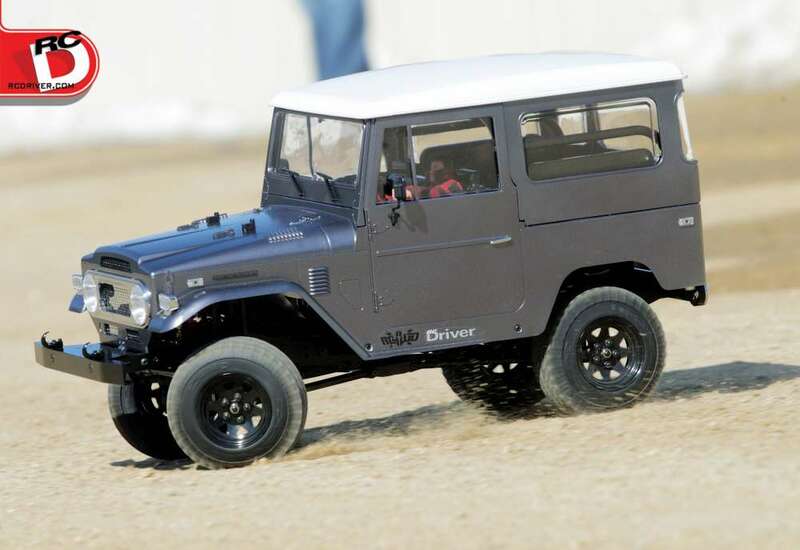 But the ability for drivers to customize and make the machines their own doesn’t stop there. 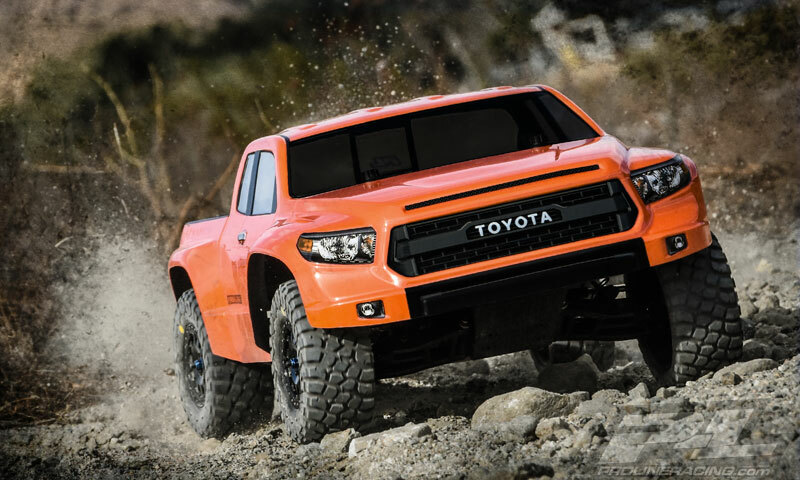 Many modify their trucks with modeling and building skills and for some bolt on hop-ups are the best. 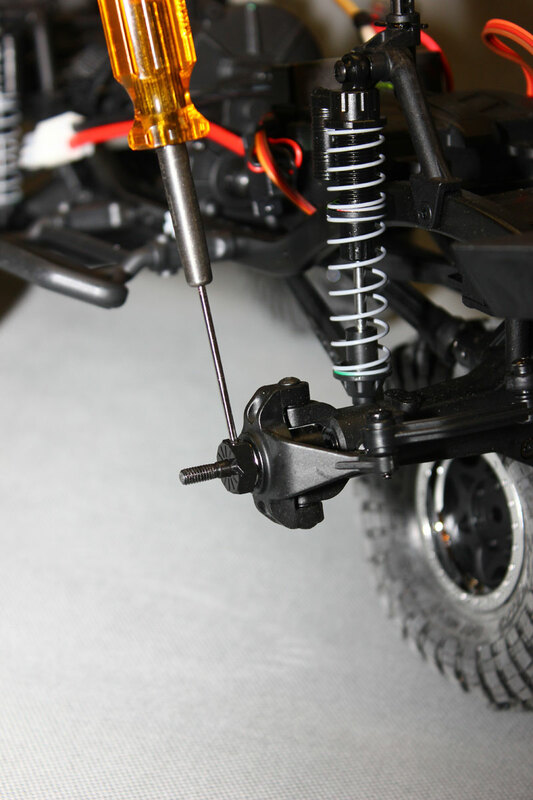 STRC is known for making easy to bolt on hop-ups for a wide range of popular machines and they’ve turned their attention to making SCX10 parts. 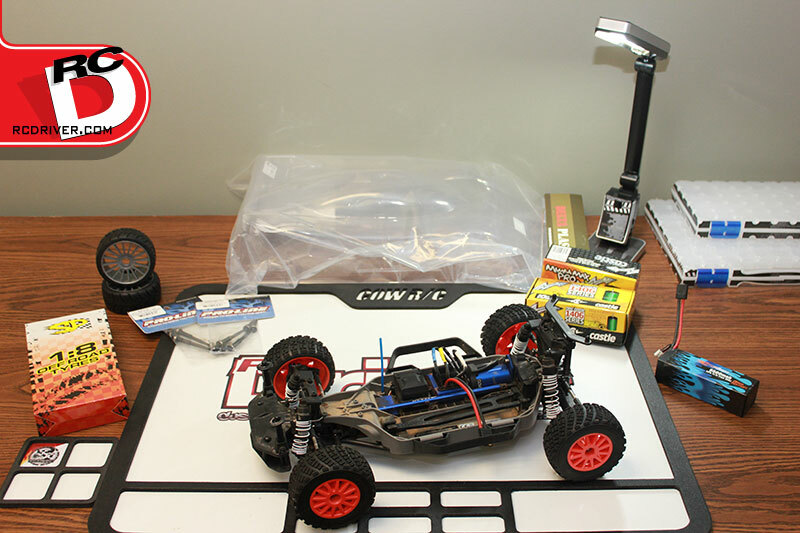 We grabbed a few of their offerings and will show you how easy it is to customize your SCX10. 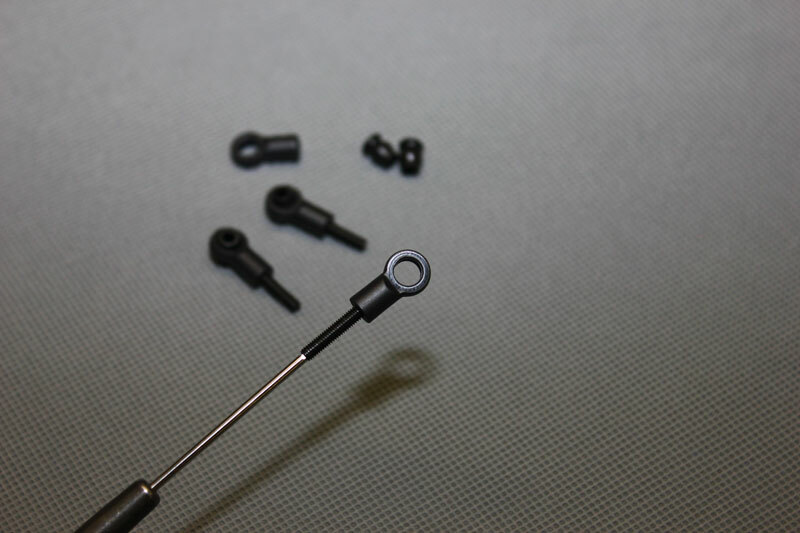 Additional Items Needed: Axial Linkage Set- AX80005, Axial hardware parts- 80018, Miscellaneous 3mm button head hardware. STEP 1. Remove the wheel nut cap, and wheel nut with a 7mm nut driver. 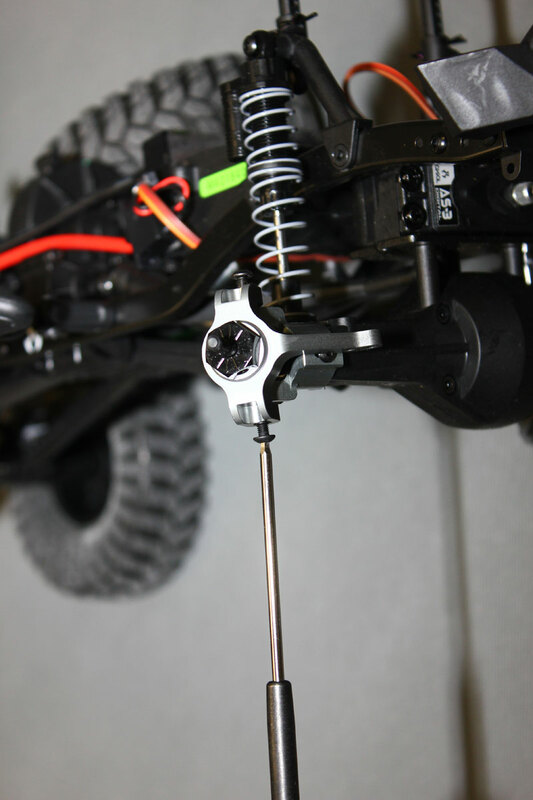 Place the wheel under the axle helps make the project easier to work on. STEP 2. 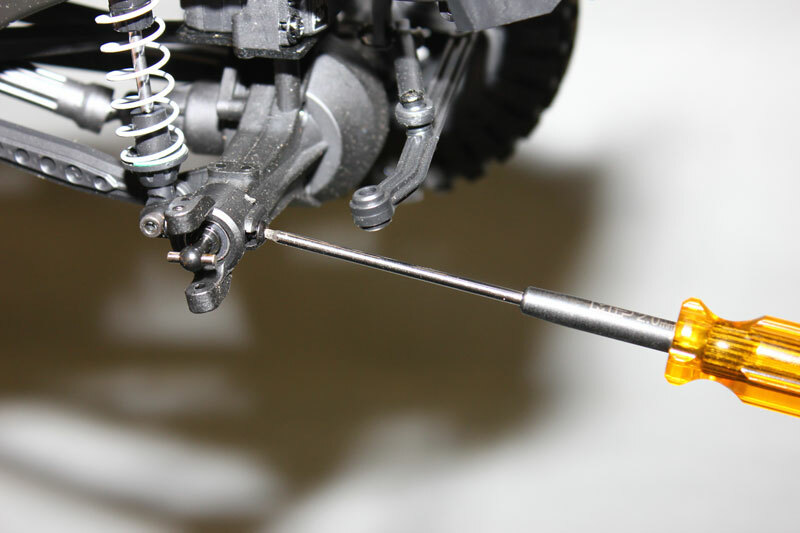 Remove the wheel hex with a 1.5mm driver. STEP 3. 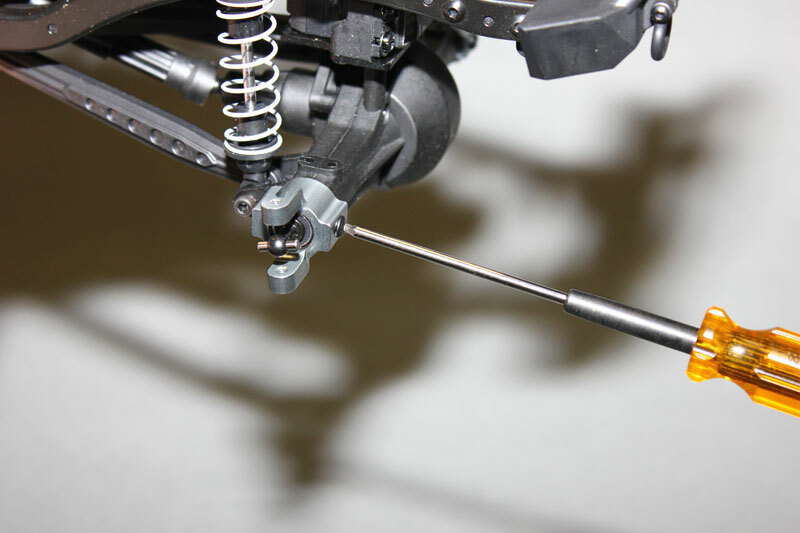 Remove the knuckle king-pin hardware using a 2mm hex driver and a Phillips driver for the steering link. STEP 4. 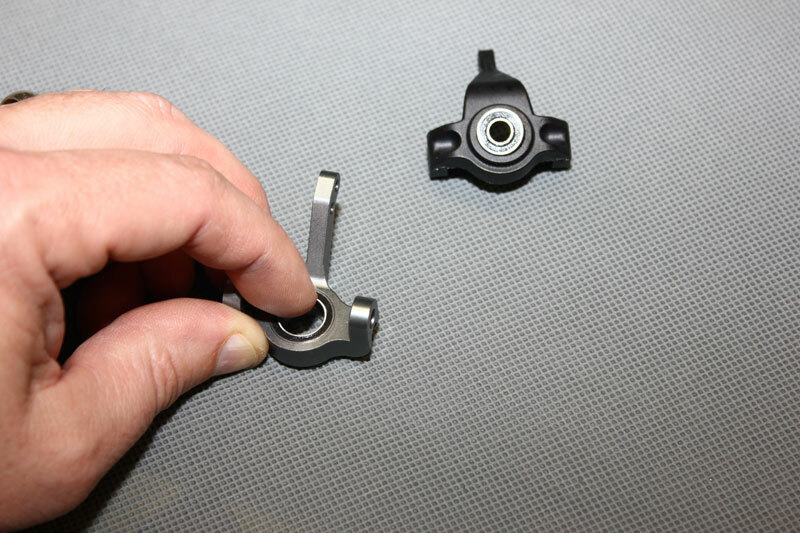 Remove the knuckle and transfer the bearing and axle to the STRC knuckle. STEP 5. 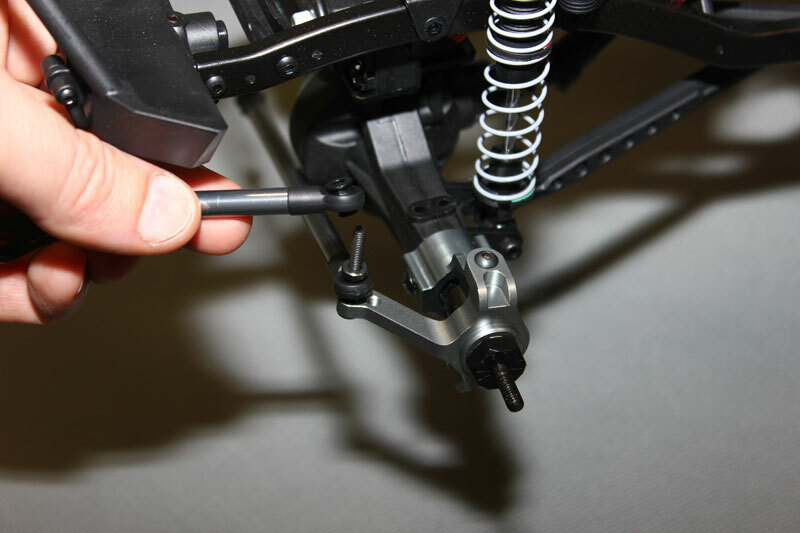 Remove the hub carrier using a 2mm hex driver on the hardware. STEP 6. Slide the stock hub carrier off noting the angle the block is on relating to the king-pin screws. 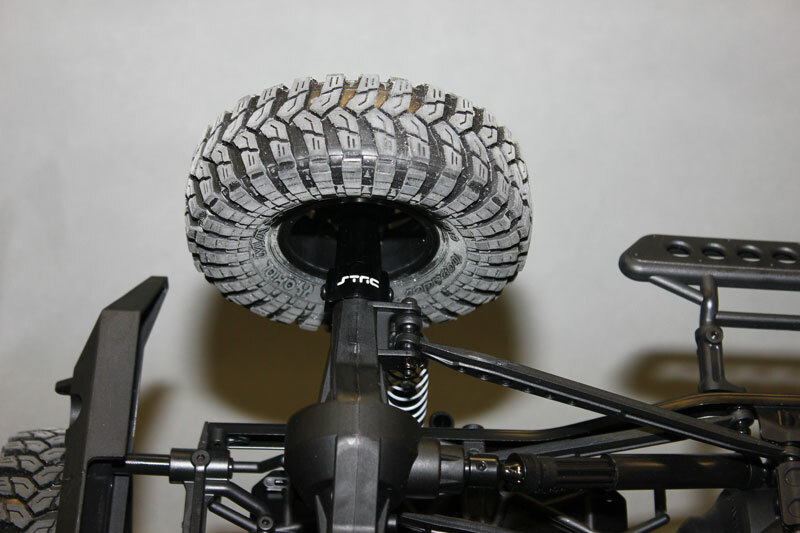 Find the proper STRC hub and slide it in place on the axle. STEP 7. Secure the new hub with the stock hardware. STEP 8. 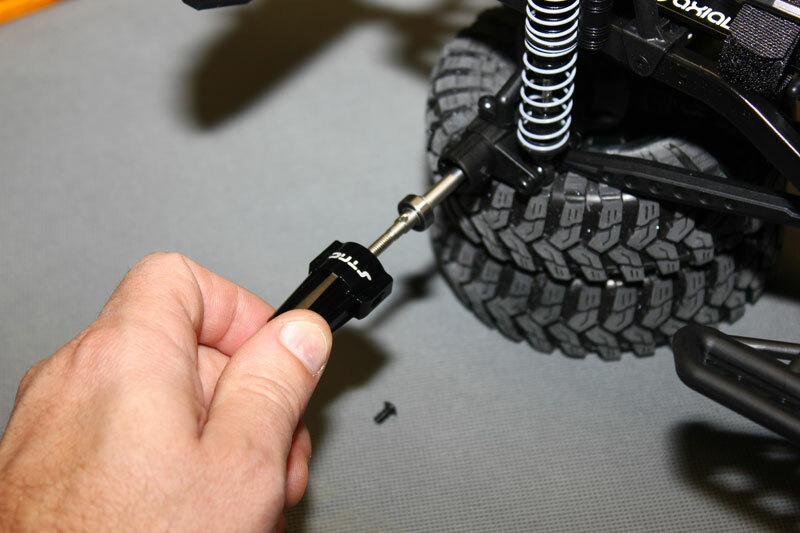 With the truck on its side, install the king-pin inserts from the stock knuckle into the STRC knuckle and slide it over the hub. STEP 9. To secure the knuckle to the hub, you will need four M3x12 metric machine screws, STRC does not supply the hardware with the knuckle. Applying threadlock here is recommended. STEP 10. The assembled steering knuckle and hub assembly. 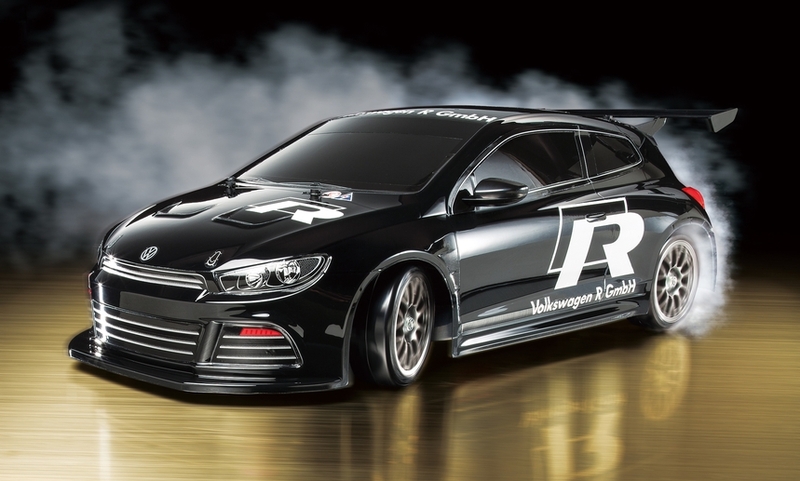 You’ll notice the stock steering removed. With the new knuckles, the stock hardware on for the steering won’t work with it. 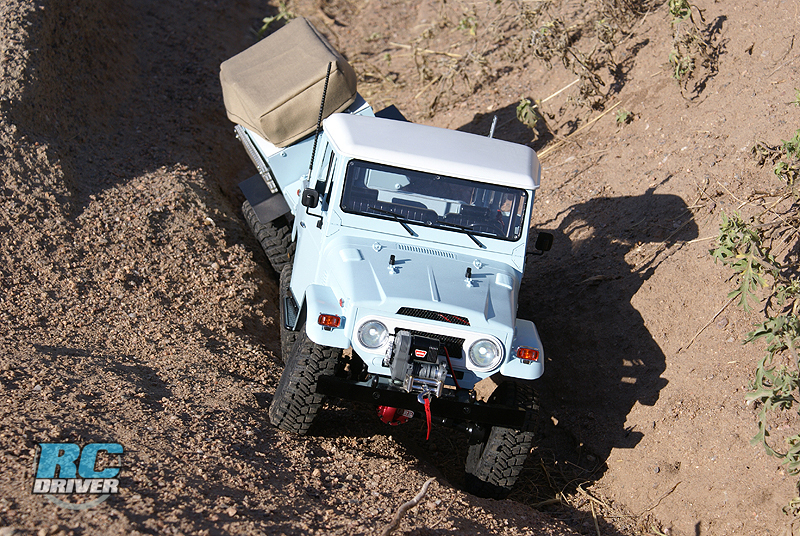 Great time to upgrade to STRC’s Steering link kit. STEP 11. 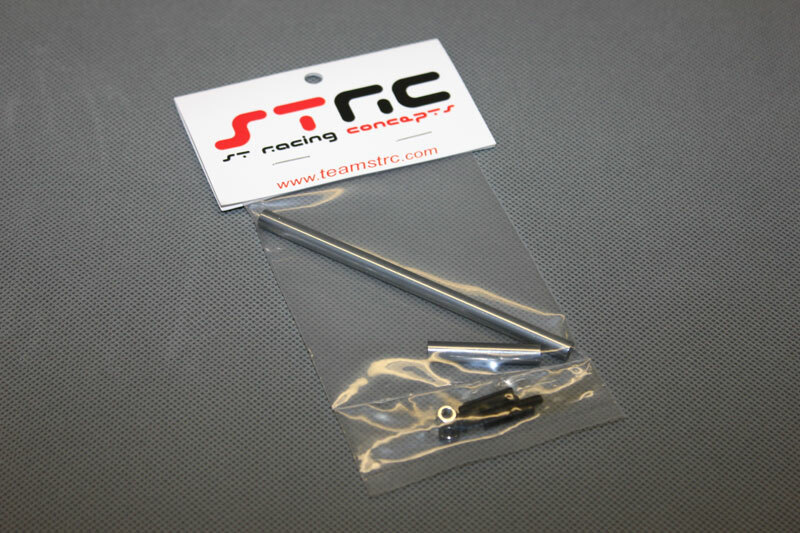 The STRC steering link requires the Axial parts listed above to complete its assembly. STEP 12. 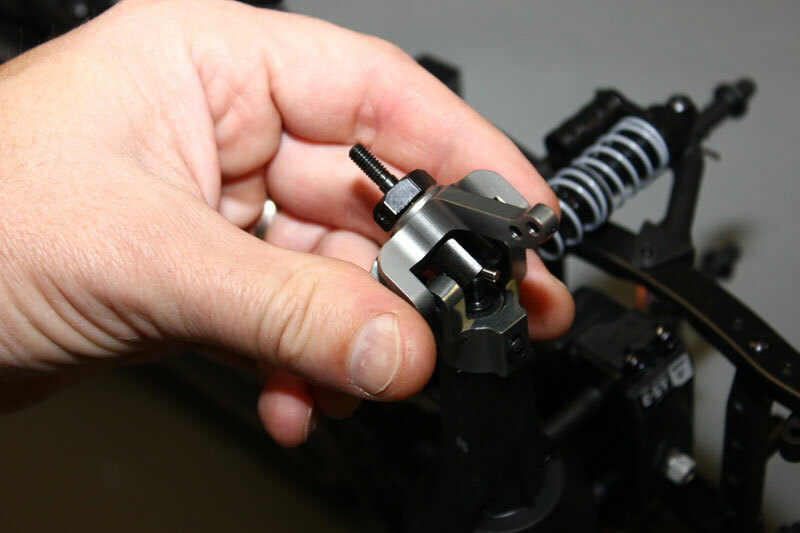 Screw the STRC set-screws into the axial ball cups and snap the pivot ball into the cups. STEP 13. 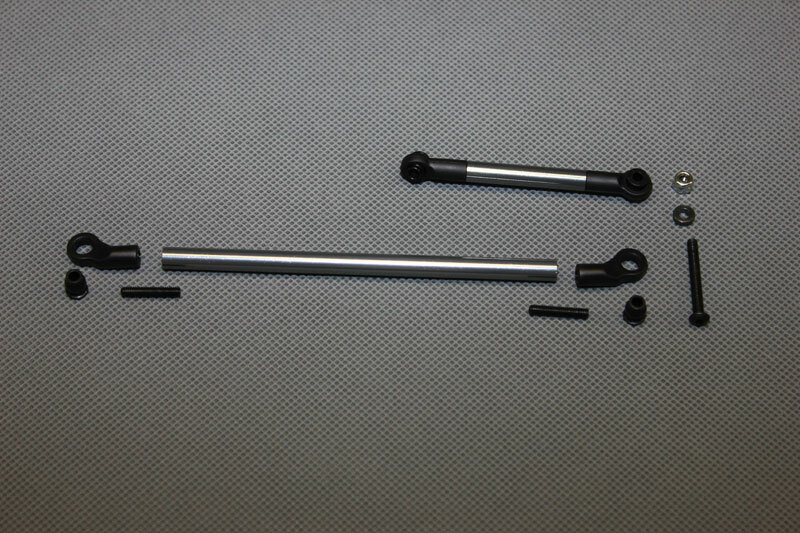 Here is the steering linkage laid out. Screw the ball ends onto the rods as shown here. Step 14. 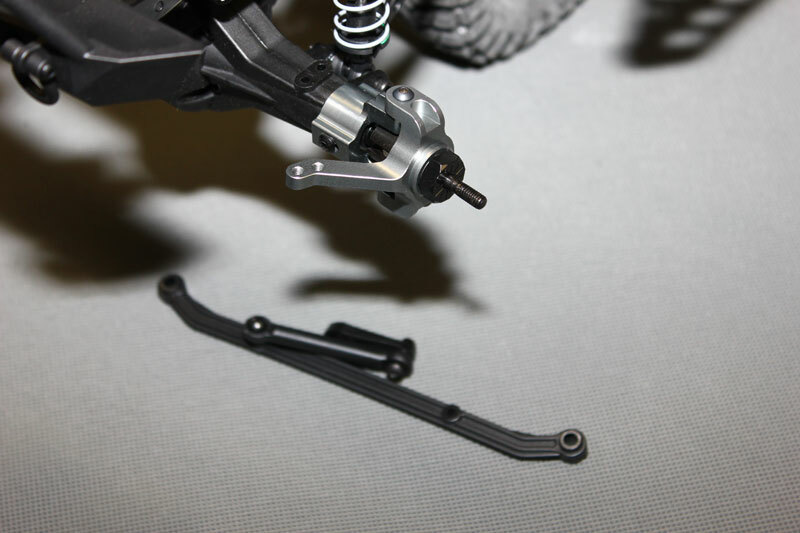 The steering link will now connect to the left hub using the long screw and nut provided in the STRC kit. 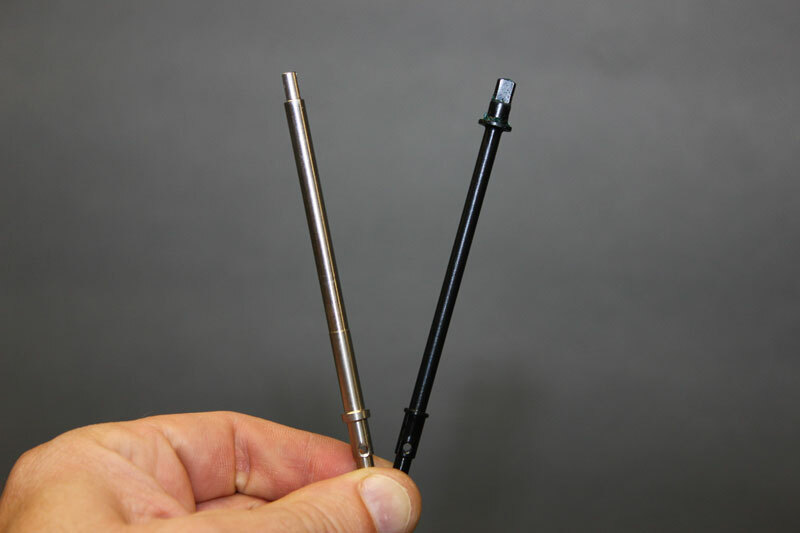 The small aluminum spacer in the kit is to space the two pivot links apart. STEP 15. 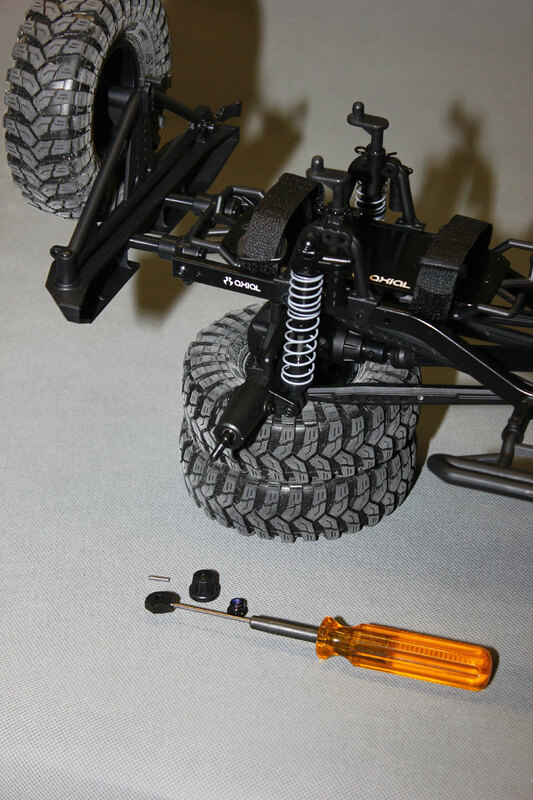 Here the steering linkage is set in place and secured to the knuckles. 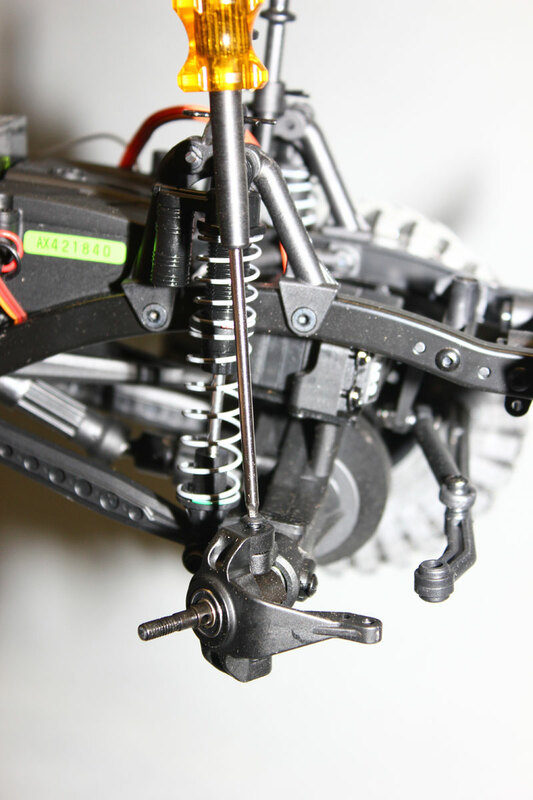 Hardware is not provided to secure the link to the left knuckle, you will need to use a M3x12 screw. STEP 16. 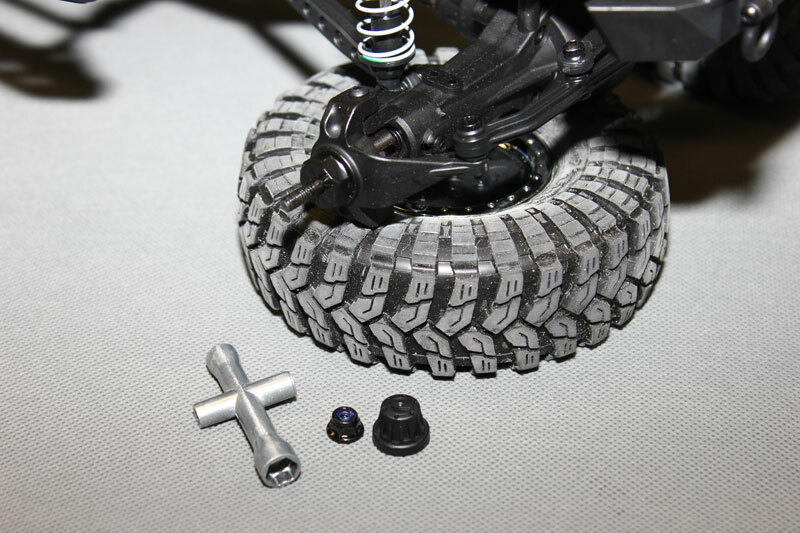 Remove the rear wheel hardware, wheel and hex hub using a 1.5mm hex driver. Step 17. 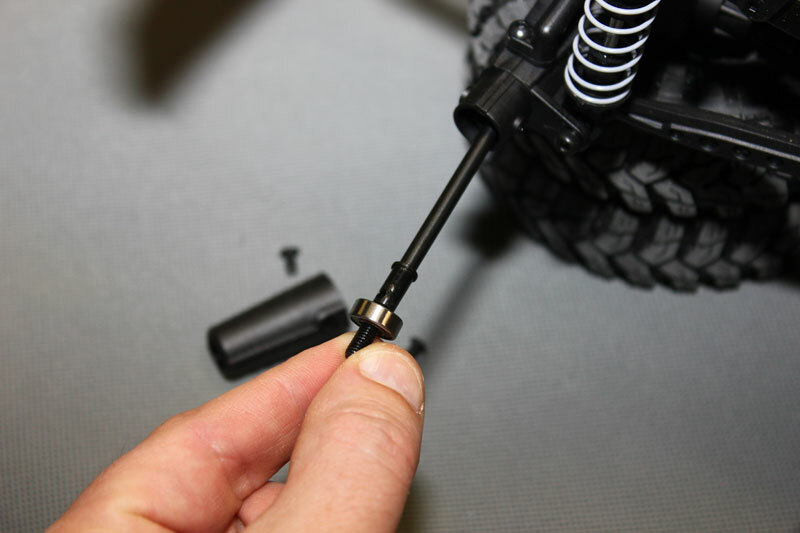 The rear hub is easy to remove, unscrew the two retaining screws and slide the lock-out tube off and then slide the stock axle out. 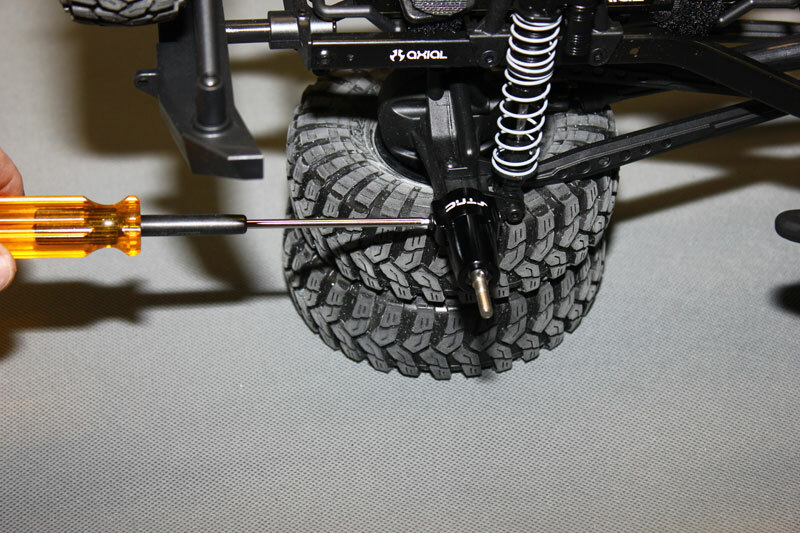 Note: Notice the STRC axle is much thicker than the stock black axle. STEP 18. Transfer the bearing over to the new axle and slide it in the axle housing. Then slide the new STRC lock-out tube in place and secure with the stock hardware. 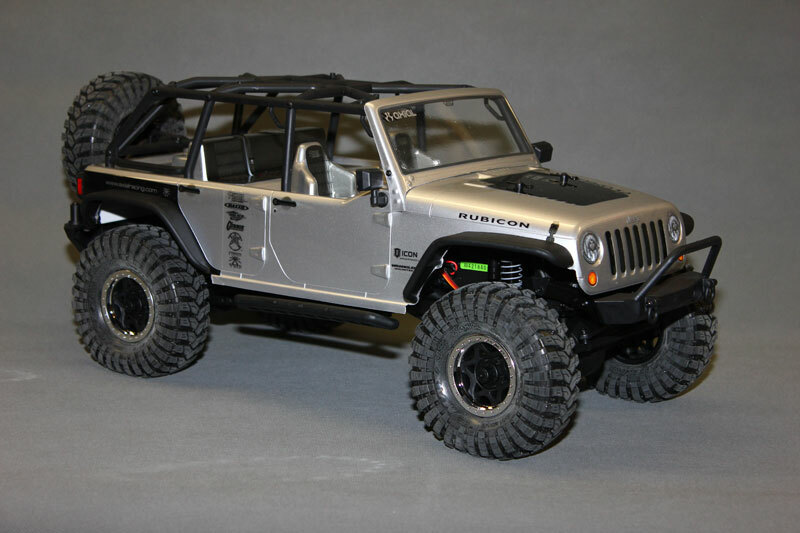 FINISHED- Fresh aluminum looks cool on any machine and the STRC goodies we outfitted our Axial SCX10 Jeep Wrangler with look awesome. 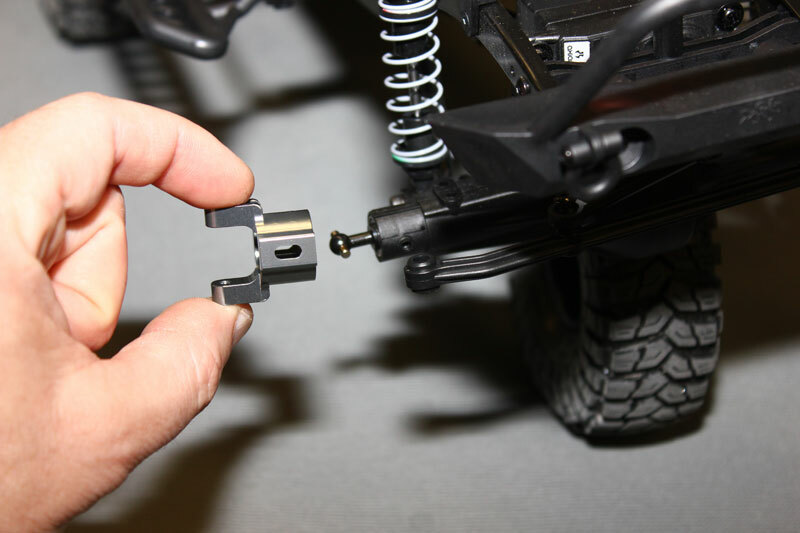 The parts are easy to install as long as you pick up the mentioned Axial support parts and have some extra hardware on hand. 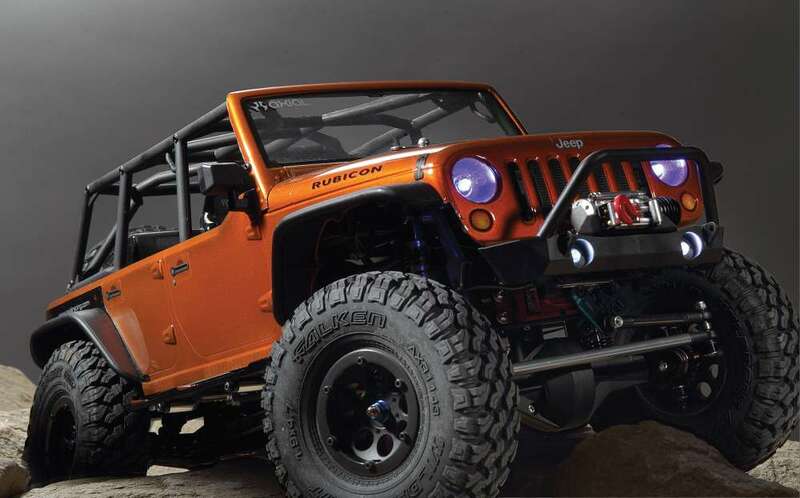 Now its time to hit the trails!